The fact that I was hungry, tired and drinking a lovely glass of wine probably had a lot to do with my momentary hallucination. Probably. Can’t you hear it now? Look at the gooey caramel, the pecans, the custard soaked bread. Yeah, you know you want it. 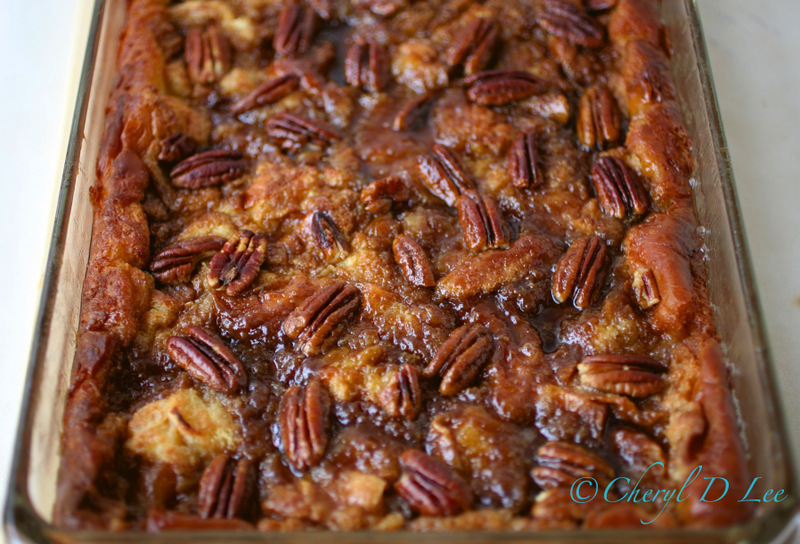 Luckily, I happen to be willing to provide you with a recipe so you can make your own Baked Cinnamon Pecan French Toast. Place the roll pieces into a 9X11 baking dish. In a large bowl whisk together the eggs, half and half, sugar, vanilla and nutmeg. Pour the custard over the bread, pressing lightly to make sure all the bread is soaked in custard. Let the bread soak for about 10 minutes, while you prepare the topping. 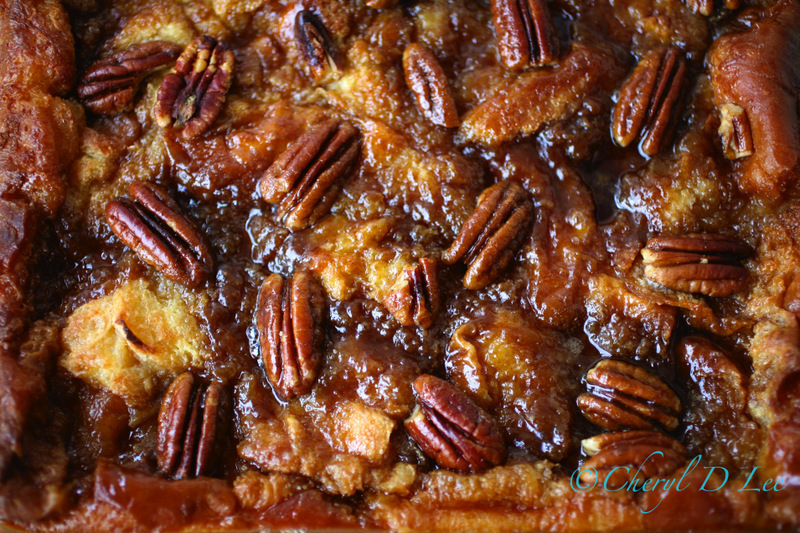 In a small bowl, mix the softened butter, brown sugar, pecans, corn syrup and cinnamon. Drop spoonfuls of the topping evenly over the bread. Bake the french toast for 35 - 40 minutes, until the top is puffed, bubbling and browned. 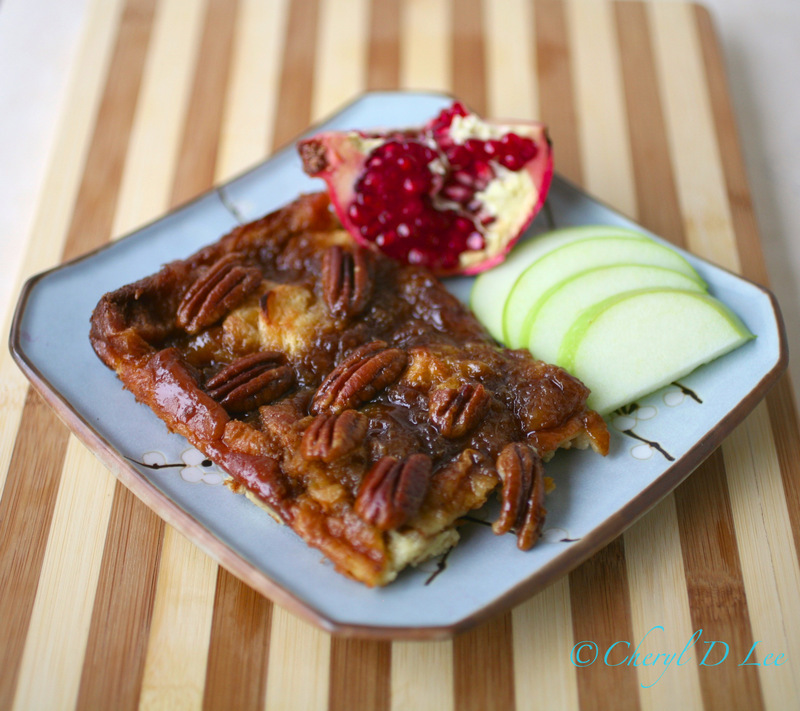 This Baked CinnamonPecan French Toast can also be made the night before. After pouring the custard over the bread, cover the dish with foil and refrigerate. Mix the topping ingredients together. Cover with plastic wrap and leave out overnight, because it needs to be soft enough to spread the next morning. The next day heat oven to 350° F. Remove foil from casserole, and spread the topping on french toast. Bake as directed above.